Julia Roberts won an Oscar for portraying a real-life female heroine in Erin Brockovich. 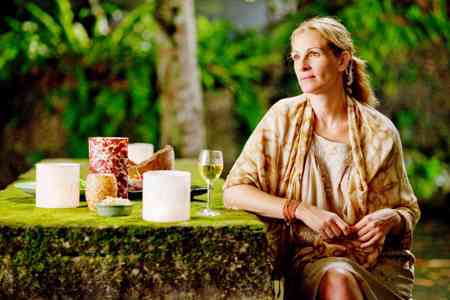 Could lightning strike twice with her portrayal of Elizabeth Gilbert in Eat Pray Love? In the first part of our Julia Roberts interview, Roberts spoke of the challenge of bringing a best-selling and globally adored book to the big screen. In the second part of our interview, Julia talks about eating pasta, whether she really gained 10 pounds and also what each co-star on her global journey meant to her as she made Eat Pray Love a cinematic triumph. Roberts also confided that she was blissful about her own life and where she is currently with husband Danny Moder and their three children. Always the consummate actress, she culled her past to channel the soul-searching wanderlust that Elizabeth Gilbert personifies in Eat Pray Love. Julia Roberts relishes her pasta! SheKnows: That soon-to-be famous scene in Eat Pray Love, where you are delighting in your bowl of pasta in Italy, was it as wonderful as it looked and also did you gain 10 pounds like Ryan (Murphy, director) has been saying? Julia Roberts: It was all delicious! Ryan hired people that were in charge of making the food look great and taste great. For the pizza, we went to Naples to where she [Elizabeth Gilbert] had eaten that pizza. I got there at eight in the morning. I started my day with eight entire pieces of pizza in 45 minutes. The deliciousness of something wears a tiny bit. You’re speed eating [laughs]. That scene, in particular, I relished wolfing it down. I felt that she was so excited to be there, so thrilled to be eating this pizza and I would eat an entire slice in a take. I don’t know why I thought that was a good idea [laughs]. Ryan tells people I gained 10 pounds, but it was a little less than that. I love every pound and everyone said it would drop right off. But, I didn’t get that memo [laughs]. SheKnows: In each part of the film, you have a different gentleman who provides a different emotional journey, what did you most adore about each of the men you starred with in Eat Pray Love? Julia Roberts: It’s funny because I have to say that Billy Crudup is one of my favorite actors. I’ve seen him on stage and in movies — he’s always been one of my very favorites. One of my concerns with him playing the husband that I leave was I didn’t want anybody to disconnect what I was going on to do. I wanted them to stay with me. Billy, I think in a lot of ways, has the greatest challenge to help create a character that you believe had a significant relationship and it just sort of fell apart in his hands. There were all these quirky things that he did that helped inform their relationship in such a way that you understood why they were together and understood why they split up. It was like a magic trick. I don’t know how he did it. It was amazing. The sad part was when it was over and I had to leave him [laughs]. SheKnows: And what about the amazing Richard Jenkins? Julia Roberts: When I went to India to see Richard, we had such a great time in rehearsal, but I was the most nervous because that relationship informs a certain anxiety and nervousness in my character. He’s so tall, he talks loud. We had the greatest time. He’s so kind in all these scenes. The way he presents them, it’s like surgery. It’s so precise. I just had to not get lost in that. The last night in India, we had dinner together and just became friends for life. SheKnows: Lastly, you went to Bali to meet the newly married Javier Bardem. How was it different arriving in Bali at the end of your shoot as a well-oiled machine and Javier was new to the fold? Julia Roberts: Javier showed up and it was like deciding to get a puppy [laughs]. You have everything in your house worked out. You think, “My life is so settled, I will get that puppy.” Then he comes in and you’re like, “I’m way too tired to have a puppy!” He came in with gusto and enthusiasm. He wanted to have lunch and go over all our scenes. Then, you realize working with him, that this is getting good. Let’s have lunch. Let’s go over the scenes. His excitement was so contagious. Each time we did a new country we got ramped up for a whole new group of people, a whole new experience. It fuses us with energy that we thought was long gone. It was reported I was a little terrified to be around him because of No Country for Old Men [laughs]. It was just great fun and play. He comes across as incredibly comfortable with his acting and performing and he really puts you at ease. I said to him at the end, “I thought you would be so intense.” He’s so sweet! SheKnows: Now, away from all those fabulous men, what was it like working with a class act in Viola Davis, who plays your best friend? Julia Roberts: It was so fabulous. For me, this was four movies and she was the person who tethered me to the world. Billy was my world in New York, but he didn’t keep me tied there. Viola was the one who kept me grounded. She has one of the great lines of the movie, the one about getting a tattoo on your face (“You need to be committed”). She’s just an amazing actress and it was so nice to get to know her and watch her perform. She’s very friendly and her talent is so ferocious that I was just glad to sit and eat cupcakes with her. She’s a lovely woman, what an honor to get to share that time as well as being in a scene together. SheKnows: How did you relate to the praying part of Eat Pray Love? Whether or not you’re religious, it doesn’t seem to matter. Julia Roberts: I think if you’ve gotten to a place in your life where you have found a capacity to eat and nourish yourself in that way, and love, then somewhere along the way, you figured out your own identity and how to pray and relate to an energy, or creation that’s more than you. Or else, you can’t accomplish those other things. How you do that, and how you name it, how you relate to it — it becomes insignificant to the act of understanding it. SheKnows: Was staying emotionally true to Elizabeth’s journey a tough one for you as you seem so happy in your own life? Julia Roberts: I think you have to find a way to relate to all of it. This particular journey that she goes on, it’s a lot, for me, to try to think about and intellectualize. Although I can’t let it go. SheKnows: Lastly, Ryan Murphy as your director, you are obviously a fan as you just signed on to do another Ryan Murphy movie. But, what did you also glean from Elizabeth Gilbert’s book? Julia Roberts: Ryan set up this shoot perfectly. It is interesting that was one of the first situations I’ve been in that did call for a lot of emotional availability and it was all there on the page. The truth of every situation was right there in front of me. It all harks back to what Liz wrote and what her experience was. It was so rich. Her ability to share all those feelings is so keen. Eat Pray Love New York premiere!